In our last FASP blog we looked at the ‘twice on the couch’ guidance for the first trimester combined test. We now want to raise awareness of the gestational age parameters for both the first and second trimester screening. We continue to emphasise the best and easiest way to facilitate this process is to encourage women to book early in pregnancy. You may be wondering why there was a photo of Winston Churchill with this blog. He once said "To improve is to change; to be perfect is to change often". This sums up one of the principles of quality assurance, that screening services should always be willing to reflect on how they can change and improve. NHS FASP aims to ensure that the programme is equitable - with access to uniform and quality assured screening across England. It’s vital that all eligible women are provided with the correct information - so that they can make an informed choice about their screening options and pregnancy outcomes. 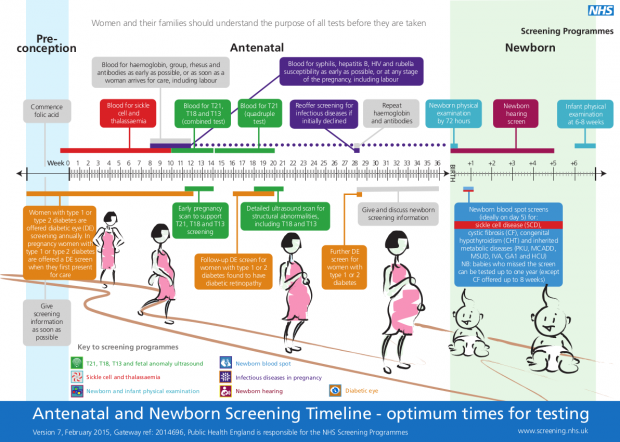 The screening options for Down’s, Edwards’ and Patau’s syndromes available to the women are dependent on the gestation of the pregnancy at the time of booking. Ideally, all women would book early enough in pregnancy to be offered screening using the combined test (measurement of the nuchal translucency (NT) and a blood test) which can be performed between 11 to 14+1 weeks of pregnancy. If women book later in pregnancy (between 14+2 to 20+0 weeks), or for some reason, the combined test could not be completed, for example, the NT cannot be measured (due to the position of the baby in the womb or if the mother is above average weight) the quadruple test is offered. However, it seems from a number of reported screening safety incidents, when this happens some women are missing out on screening that they have chosen to have. “It was the community midwife who I saw at my local Children’s Centre. There was so much information given to me at the appointment I got confused and didn’t realise I needed to book a further appointment myself when I was 16 weeks pregnant. I missed a test due to this mistake…. Pregnancy is a time when women are given quite a bundle of information. Processes vary from one service to another so the reality is that many women get confused and can be unclear of when, how and why appointments are made. This may result in them not turning up for appointments. This could lead to a situation which may limit a woman's reproductive choices and the potential unexpected birth of a child affected by Down’s, Edwards’ or Patau’s syndrome where this would not have been the woman’s choice. Does your maternity booking appointment system enable and encourage women to book as early as possible? Do you prioritise booking appointments by gestational age? How do you assure yourself that women who do not complete the first trimester combined screening are referred for second trimester quadruple screening? What processes do you have in place to ensure all women booked are offered screening appropriate for the gestation of the pregnancy? Have you ever audited all or any of the above? If not, why not put it in a work-plan today! - identify when you will start, who is going to support you to do it and when you will complete it. The national FASP standards now include a measure for screening coverage. It is hoped that this will support providers in identifying whether their current processes are robust enough. This is to ensure that all eligible women are offered screening and those that accept screening in either the first or second trimester of pregnancy complete the screening and receive a result to on which to base further pregnancy choices. To return to Winston Churchill's quote for a second, why not ask yourselves and screening colleagues in your organisation how you could strengthen your processes to give a timely, equitable and safe screening service?